Jordan B was elected to a new term. Final vote count 17-12. It was a great turnout. Thank you all who participated. Piatt Meadows will be holding a vote for a trustee position, which will be a 3 year term. The vote will take place on Monday April 8th at 6:30 PM in the community lot off of Marilyn. This vote will be 1 vote per household. Follow the event on our Facebook page for updates. The annual meeting will be Sat Mar 16th at 10am; held in the large meeting room at the Orange branch of the Delaware County library. 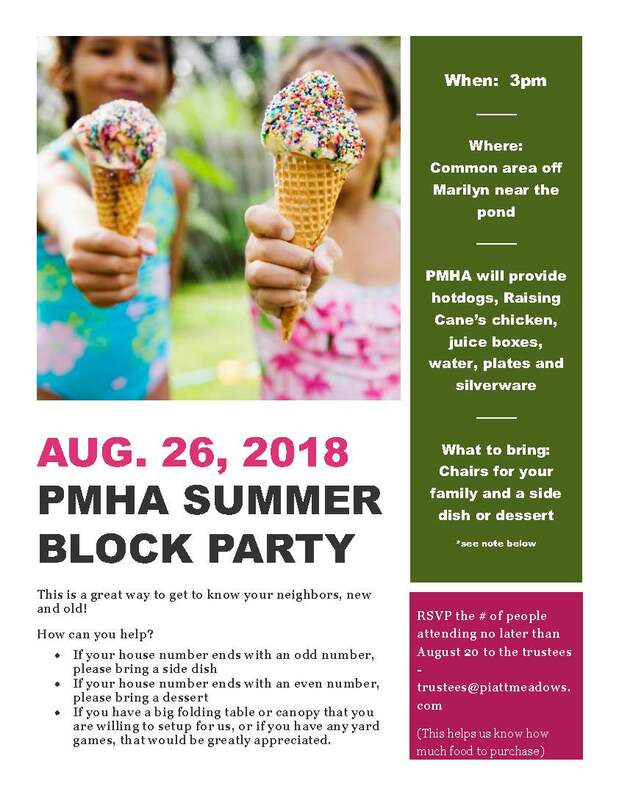 This is a great way to get to know your neighbors, new and old! 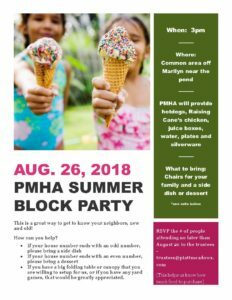 PMHA will provide hotdogs, Raising Cane’s chicken, juice boxes, water, plates and silverware. If you have a big folding table or canopy that you are willing to setup for us, or if you have any yard games, that would be greatly appreciated. The annual meeting will be Sat Feb 17th at 10am; held in the large meeting room at the Orange branch of the Delaware Cty library. Please find the meeting notes attached. On behalf of the trustees, I thank you for your patience as we took our time in discussing how we want to interpret the deed restriction relating to trash bins and what we would accept as an acceptable screen. Please see the attached document link below for more details. Any homeowner who wishes to keep their bins outside, and doesn’t currently have an acceptable screen, must have a design/plan submitted to the design review committee by Dec. 1, 2017. The submission to the DRC must also include a timeline of implementation. We understand that some plans may need to be constructed in the spring. In order for us to work with you, we need to understand both the design and installation.